As a young woman I worked for a bank in a branch office. Prior to opening each morning, the teller assigned to the task, went through the newspaper obituaries. If any of our customers was reported deceased, the teller placed a hold on their accounts, including joint accounts, and sealed their safe deposit box. 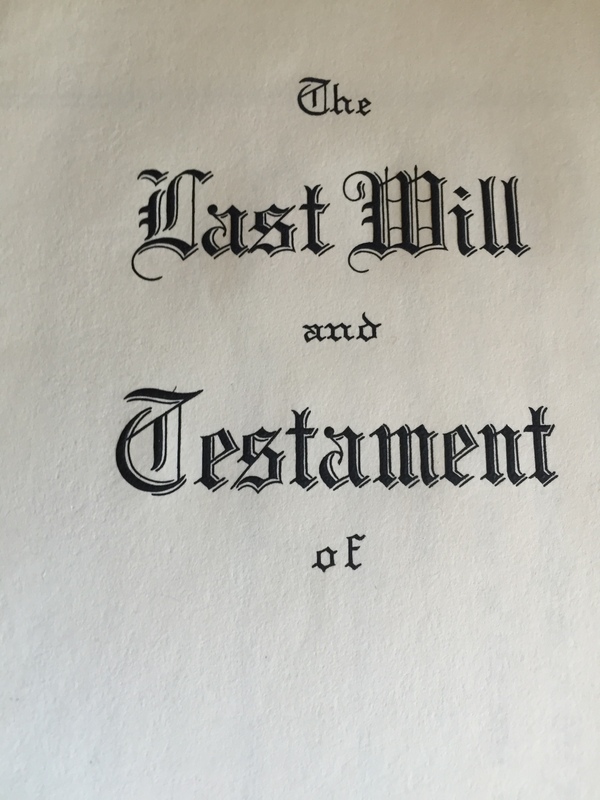 Sometimes, even people with a Last Will and Testament, left their relatives in a bind when the only place that held a copy of the will was the sealed safe deposit box. Waiting for a probate judge’s order to open the box takes time and costs money. Anytime you have to go to court for anything, you should see dollar signs. However, many people did no planning at all, dying intestate, meaning without a will. We had a saying at the bank, “If you don’t have a will, the state has one for you.” You may intend for all your worldly possessions to go to your spouse but, depending on the state where you live, without a will, state law may dictate your estate is split evenly among your spouse and children, no matter what the age of the children. Don’t assume your children will do the right thing by mom or dad and give the money back to the surviving spouse. And with probate courts inundated with cases, an attorney recently told me it can take up to a year for an estate with a will to get through probate. This is reality, folks. We all know someone who died suddenly, perhaps from a heart attack or car accident. Yet, most of us put off estate planning thinking, “We’ll get to it later.” Yes, we all do it. Even me. Despite all the life lessons from my banking days, until recently, I had not updated my will for years. No one wants to think about dying. We are a frail type, we humans, who don’t want to face our mortality. We like to think we always have more time. We fool ourselves into thinking, ‘later’ will always be there for us. The heart attack or car accident isn’t the way we will go. Oh no, not us. The truth is we have no idea the day, the hour, the minute or the how. My dad used to joke about it saying, “Something’s gonna get ya. Nobody gets out alive.” Then, he’d laugh at his own joke. Fortunately, both he and my mother left a plan, allowing we children to grieve instead of wending our way through the overwhelming task of trying to figure out what they wanted in the way of funeral arrangements or how to pay for them. There’s enough to decide even with a will. Without a road map, it’s really stressful. That’s how family squabbles happen. And, who wants that to be their legacy? End of life planning is complicated these days. In South Carolina, where I live, probate court can be avoided by having a trust agreement, rather than just a will. Then, there are revocable trusts and irrevocable trusts. And, just in case you forgot some old account someplace or another, a will can be embedded into the trust. This isn’t an ad for attorneys, but, the truth of the matter is, you probably need one to advise you on what is best for your circumstance in the state in which you live. Just in case that isn’t enough to think about, matters are further complicated by the need for Powers of Attorney for both health care and financial management. These documents cover any eventuality where you become unable to make your own decisions regarding your health and money management. Since each document is separate from the other, the health care attorney-in-fact doesn’t necessarily have to be the same person as the financial attorney-in-fact. Before naming someone to either of these positions, be sure to discuss your decision with that person asking them for their agreement to accept the task. Nobody likes surprises. This is serious business, so cross all the t’s and dot all the i’s. You may also be asked to name alternates because, as we know, stuff happens, and your primary may become deceased or incapacitated themselves, rendering them incapable of carrying out the task. Your attorney will most likely ask you to name a runner up, or two. Whew! Although this is a serious subject requiring serious consideration, action and, let’s not forget, money, it is the best gift you can give to your survivors. Despite my feet dragging on the matter of updating my planning, the big lesson – well one of them – I learned in life is this. If you don’t make a decision and take action, time and circumstance will make the decision for you and you may not like the outcome. To that, someone said to me about making a will, “What do I care? I’ll be gone!” If you care about your survivors, whether spouse, children, siblings, significant others or grandchildren, give them the gift of not having to squabble over your health care, funeral arrangements and money. Give them the gift of being able to just grieve without worry about the details because you left a detailed plan. And, one last thing – no excuses – dreary as it is, there’s no time like the present to create your plan. We all have them throughout our lives. Defining moments. Events which teach us life lessons, expose us to something as never before. Moments of joy, happiness, or sorrow and pain. Fifty years ago I was an eleven year old in Mrs. Gipe’s English class when my Dad opened the classroom door and said, “The Principal asked me to tell you the President’s been shot. He died. We’ve called for the buses to take the children home. I’ll let you know when they’re here.” You see, my Dad was the elementary school janitor. In the days before classroom phones and intercoms, he was often given the added job of spreading news from room to room. As I watched his face, I realized how heavy this particular news was for him. I also realized it was perhaps even more heavy a burden because this week marked the fourth anniversary of my brother Leon’s death in a car accident. Sadness already filled our house. Mrs. Gipe, being an English teacher and loving poetry, took out a book and started reading “O Captain, My Captain” by Walt Whitman. As she read the poem about Abraham Lincoln’s death, her voice faltered now and again, but she never broke down in front of us kids. Other than her voice, the room was so quiet it was hard to believe there were about 30 eleven year olds sitting there. She never had time to finish reading the poem to us as my Dad opened the door a few minutes later to announce the arrival of the school buses. As we filed out to the sidewalk, I saw my Mom on the corner waiting to cross the kids, who walked home, safely to the other side of the street. You see my Mom was the crossing guard. She always looked very professional and in charge in her police uniform but she always smiled as she greeted the kids. Today, her face looked sad. I knew she had looked that way all week, often standing in front of the piano in our living room just staring at my brother’s photos. And, although Thanksgiving was just a week away, there was a lull over our house hushing down any anticipation of the holiday season to come. On the bus, Ginnie, a girl in my class broke down and started crying. There were others crying, too. But, I sat in the seat across from Ginnie and we lived near each other and played together and were in Girl Scouts together and had been in the same class since kindergarten. I knew her pretty well. So, it was she who I told it would be O.K. “But, what’s going to happen to us?” she wailed. I heard myself tell her, “Nothing. Everything’s going to be O.K.” I didn’t know if everything was really going to be O.K. But, when my brother was killed, people told me everything was going to be O.K. so I repeated it to Ginnie. Nothing seemed to be the same since his death but I still had a family, my Dad still worked at the school I attended and my Mom now stood on the school corner every morning and afternoon making sure kids crossed the street in safety. Our family still did most of the things we always did. There was just a piece missing. It wasn’t the same, but, it was O.K. At the time I was too young to realize it, but Kennedy’s assassination intertwined with the experience of my brother’s death was a defining moment for me. As I look back fifty years, I recognize there were many kids on that school bus who had never experienced the death of anyone. They were afraid, confused, saddened. While the thought of the President being murdered was scary to me, I was one of the kids who was able to remain calm and offer comfort to my friends and classmates. I knew life would change but it would also go on. In that moment, a defining moment, I grew up just a little bit more. When I was working and had a particularly stressful day, I used to joke about running away in my retirement to Tibet or Nepal or someplace very exotic and becoming a Zen Master. There, I would scrub floors and meditate all day as I attained a relaxed state of calm and enlightenment, peace and tranquility. For starters, this idea was far-fetched because the monks are all men. Women need not apply. Although they might let me scrub the floors. And, though the scenery may be spectacular, living in the Himalayas or under China’s rule isn’t my idea of a fun retirement. Lastly, being a child of the ’60s, my exposure to Zen was the U.S. version, which first appeared on my radar, well, in the ’60’s. So, I wasn’t even sure if Tibet and Nepal is where Zen Masters really resided. But, when stress came knocking, it was fun to think of living in a meditative state of mind in some far off land. Then, one day, as I watched one of my cats stretch into a yoga-like pose with paws way out front and her back elongated in a sort of exaggerated arch, I realized I live with Zen Masters. Seven of them to be exact. They spend their days either sleeping or meditating, especially if the warmth of the sun is involved. They wake slowly from their long naps, pulling themselves upright to a sitting position as they look about blink-eyed before they start their meditation. Sometimes, a little cleaning of the face is in order post meditation and before they slowly stroll toward their food dishes, tails held high in a slow dance. Yes, cats are masters at the art of Zen. To find out how we acquired seven, you’ll have to read “The Story of Cats”, which I have yet to write. But, the very short version is this. Four of them actually acquired us. Ferals who arrived as kittens, they took us in with their tiny furry faces filled up by big, curious eyes. Three of them are part of the original Snacky Rudy Baker Project started seven years ago. Trapped one by one in January 2007, they were “fixed” and received first vaccinations at a low cost spay/neuter clinic, which willingly took feral cats. Now, once a year, we upset their Zen days of sunning themselves on the banks behind our house to take them one by one to our vet for a yearly check-up and booster shots. This morning it’s the turn of Zen Master Grady, aka Mr. Gray, affectionately called Grady Bear by me. 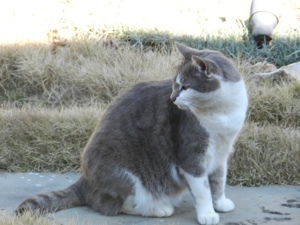 A beautiful soft gray with tabby stripes, white feet and big green eyes, he weighs in at about 18 pounds. So, although the Masters now trust us to a point, it’s no easy feat to get Grady into a carrier. Martin and I are both tense as he goes out onto the veranda to set out their breakfast while I hide at the kitchen door holding an open carrier. As Grady and the others gather around Martin in anticipation of their morning meal, purring and rubbing against his legs in their Zen-like morning prayer, Martin reaches down and picks Grady up, petting as he walks hurriedly toward the door. As I come through the door frame, suddenly Grady realizes what’s happening, stiffens his body, but to no avail, as Martin drops him through the top of the carrier and closes the door. This part of the trauma is over. Zen no more, Master Grady puts out tiny, frightened mews for the next hour and a half before his appointment. Our vet is our vet because she welcomes all the Zen Masters. We fired the last guy as feral cats need not show up at his office. Too snooty for the downtrodden, we looked for a more Zen-like vet. So, today, Dr. Silver sits cross-legged on the floor, gently coaxing Grady from his hiding place between Martin, also sitting on the floor, and the bright orange wall splashed with cat paw prints. As Grady slowly emerges from his hiding place, Martin slides off to the side so Dr. Silver can exam Grady. She coos softly to him as she checks his vital signs, talks to us about his condition and expertly delivers his shots. Whew! All done for another year. Back home after a short ten minute ride, Martin releases Grady from the carrier. He quickly meets up with one of the other Masters, happily butts heads in a “Hey, I’m back!” motion and runs off into the woods. A few minutes later, as we look through the trees to a sunlit spot, we see three of the cats walking slowly, one behind the other. As they look for meditation nooks among the rocks, Grady is in the lead. Finding just the right place to soak up some rays, Grady settles down into the leaves and blinks his green eyes at the sunlight sifting through the trees. Ahhh…calm and enlightenment. The relaxed state of peace and tranquility has returned to the great Zen Master Grady Bear.